Humana and its local partner DAPP been launched in Zambia, with the support of the EU, a project to promote community schools, of which about 50,000 children in rural areas will benefit. 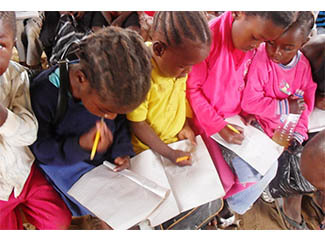 In Zambia, it is estimated that around 30% of children attend what is known as community schools. Community schools began over two decades ago to meet the needs of children in rural and peri-urban areas, who did not live in close proximity to government schools, or whose families could not afford school fees and uniforms. Many were set up by religious organisations and NGOs, but a large number are also run exclusively by the local community. This third type of school is often under-resourced and is only maintained by the sheer will of community members. Parents and volunteers oversee their day-to-day running, and families often pay a small amount each month to cover the teacher’s basic living costs. Until very recently, community schools have received little attention or support from the government. However, they are a mark of people’s determination and ability to mobilise and self-organise. Community schools meet a huge need in the society, providing essential education to children who would otherwise not have access to the system. However they are not without their problems. Teachers in these schools have often never received any formal training, and a significant amount of them do not have running water or adequate hygiene facilities. In 2011, the Zambian government passed legislature to recognize community schools as legal entities, and began the process to support and integrate them into the official education system. Fundación Pueblo para Pueblo in-country partner DAPP- Zambia has extensive experience in training primary school teachers for rural areas, and this year will begin a project to support 160 community schools in the Northern, Muchinga and Central provinces. The EU-financed project will provide training to existing teachers and school management, as well as improving school infrastructures to the benefit of an estimated 50,000 children. In addition, project leaders will work with local authorities and mobilise parents committees in order to increase support for the schools. The three-year intervention is expected to begin in the coming months with a survey to obtain a comprehensive understanding of the communities’ current circumstances. During the process, project leaders will also identify 5,000 vulnerable households to receive income-generation training in order to increase their children’s access to school.